Why has the little nation of Qatar spent 3 billion dollars to support the rebels in Syria? Could it be because Qatar is the largest exporter of liquid natural gas in the world and Assad won’t let them build a natural gas pipeline through Syria? Of course. Qatar wants to install a puppet regime in Syria that will allow them to build a pipeline which will enable them to sell lots and lots of natural gas to Europe. Why is Saudi Arabia spending huge amounts of money to help the rebels and why has Saudi Prince Bandar bin Sultan been “jetting from covert command centers near the Syrian front lines to the Élysée Palace in Paris and the Kremlin in Moscow, seeking to undermine the Assad regime”? Well, it turns out that Saudi Arabia intends to install their own puppet government in Syria which will allow the Saudis to control the flow of energy through the region. On the other side, Russia very much prefers the Assad regime for a whole bunch of reasons. One of those reasons is that Assad is helping to block the flow of natural gas out of the Persian Gulf into Europe, thus ensuring higher profits for Gazprom. Now the United States is getting directly involved in the conflict. If the U.S. is successful in getting rid of the Assad regime, it will be good for either the Saudis or Qatar (and possibly for both), and it will be really bad for Russia. This is a strategic geopolitical conflict about natural resources, religion and money, and it really has nothing to do with chemical weapons at all. Qatar has proposed a gas pipeline from the Gulf to Turkey in a sign the emirate is considering a further expansion of exports from the world’s biggest gasfield after it finishes an ambitious programme to more than double its capacity to produce liquefied natural gas (LNG). “We are eager to have a gas pipeline from Qatar to Turkey,” Sheikh Hamad bin Khalifa Al Thani, the ruler of Qatar, said last week, following talks with the Turkish president Abdullah Gul and the prime minister Recep Tayyip Erdogan in the western Turkish resort town of Bodrum. “We discussed this matter in the framework of co-operation in the field of energy. In this regard, a working group will be set up that will come up with concrete results in the shortest possible time,” he said, according to Turkey’s Anatolia news agency. Other reports in the Turkish press said the two states were exploring the possibility of Qatar supplying gas to the strategic Nabucco pipeline project, which would transport Central Asian and Middle Eastern gas to Europe, bypassing Russia. A Qatar-to-Turkey pipeline might hook up with Nabucco at its proposed starting point in eastern Turkey. Last month, Mr Erdogan and the prime ministers of four European countries signed a transit agreement for Nabucco, clearing the way for a final investment decision next year on the EU-backed project to reduce European dependence on Russian gas. “For this aim, I think a gas pipeline between Turkey and Qatar would solve the issue once and for all,” Mr Erdogan added, according to reports in several newspapers. The reports said two different routes for such a pipeline were possible. One would lead from Qatar through Saudi Arabia, Kuwait and Iraq to Turkey. The other would go through Saudi Arabia, Jordan, Syria and on to Turkey. It was not clear whether the second option would be connected to the Pan-Arab pipeline, carrying Egyptian gas through Jordan to Syria. 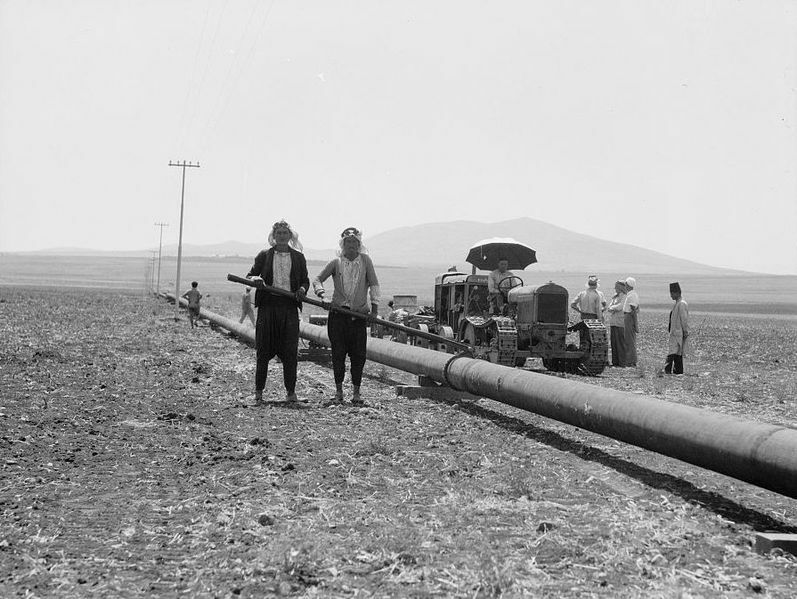 That pipeline, which is due to be extended to Turkey, has also been proposed as a source of gas for Nabucco. Based on production from the massive North Field in the Gulf, Qatar has established a commanding position as the world’s leading LNG exporter. It is consolidating that through a construction programme aimed at increasing its annual LNG production capacity to 77 million tonnes by the end of next year, from 31 million tonnes last year. However, in 2005, the emirate placed a moratorium on plans for further development of the North Field in order to conduct a reservoir study. The Iran-Iraq-Syria pipeline plan was a “direct slap in the face” to Qatar’s plans. No wonder Saudi Prince Bandar bin Sultan, in a failed attempt to bribe Russia to switch sides, told President Vladmir Putin that “whatever regime comes after” Assad, it will be “completely” in Saudi Arabia’s hands and will “not sign any agreement allowing any Gulf country to transport its gas across Syria to Europe and compete with Russian gas exports”, according to diplomatic sources. When Putin refused, the Prince vowed military action. The Nabucco Agreement was signed by a handful of European nations and Turkey back in 2009. It was an agreement to run a natural gas pipeline across Turkey into Austria, bypassing Russia again with Qatar in the mix as a supplier to a feeder pipeline via the proposed Arab pipeline from Libya to Egypt to Nabucco (is the picture getting clearer?). The problem with all of this is that a Russian backed Syria stands in the way. Qatar would love to sell its LNG to the EU and the hot Mediterranean markets. The problem for Qatar in achieving this is Saudi Arabia. The Saudis have already said “NO” to an overland pipe cutting across the Land of Saud. The only solution for Qatar if it wants to sell its oil is to cut a deal with the U.S. Recently Exxon Mobile and Qatar Petroleum International have made a $10 Billion deal that allows Exxon Mobile to sell natural gas through a port in Texas to the UK and Mediterranean markets. Qatar stands to make a lot of money and the only thing standing in the way of their aspirations is Syria. The US plays into this in that it has vast wells of natural gas, in fact the largest known supply in the world. There is a reason why natural gas prices have been suppressed for so long in the US. This is to set the stage for US involvement in the Natural Gas market in Europe while smashing the monopoly that the Russians have enjoyed for so long. What appears to be a conflict with Syria is really a conflict between the U.S. and Russia! The main cities of turmoil and conflict in Syria right now are Damascus, Homs, and Aleppo. These are the same cities that the proposed gas pipelines happen to run through. Qatar is the biggest financier of the Syrian uprising, having spent over $3 billion so far on the conflict. The other side of the story is Saudi Arabia, which finances anti-Assad groups in Syria. The Saudis do not want to be marginalized by Qatar; thus they too want to topple Assad and implant their own puppet government, one that would sign off on a pipeline deal and charge Qatar for running their pipes through to Nabucco. Yes, I know that this is all very complicated. But no matter how you slice it, there is absolutely no reason for the United States to be getting involved in this conflict. Al-Qaeda linked terrorists in Syria have beheaded all 24 Syrian passengers traveling from Tartus to Ras al-Ain in northeast of Syria, among them a mother and a 40-days old infant. Gunmen from the terrorist Islamic State of Iraq and Levant stopped the bus on the road in Talkalakh and killed everyone before setting the bus on fire. Is this really who we want to be “allied” with? And of course once we strike Syria, the war could escalate into a full-blown conflict very easily. The proposed AUMF focuses on Syrian WMD but is otherwise very broad. It authorizes the President to use any element of the U.S. Armed Forces and any method of force. It does not contain specific limits on targets – either in terms of the identity of the targets (e.g. the Syrian government, Syrian rebels, Hezbollah, Iran) or the geography of the targets. Its main limit comes on the purposes for which force can be used. Four points are worth making about these purposes. First, the proposed AUMF authorizes the President to use force “in connection with” the use of WMD in the Syrian civil war. (It does not limit the President’s use force to the territory of Syria, but rather says that the use of force must have a connection to the use of WMD in the Syrian conflict. Activities outside Syria can and certainly do have a connection to the use of WMD in the Syrian civil war.). Second, the use of force must be designed to “prevent or deter the use or proliferation” of WMDs “within, to or from Syria” or (broader yet) to “protect the United States and its allies and partners against the threat posed by such weapons.” Third, the proposed AUMF gives the President final interpretive authority to determine when these criteria are satisfied (“as he determines to be necessary and appropriate”). Fourth, the proposed AUMF contemplates no procedural restrictions on the President’s powers (such as a time limit). (1) Does the proposed AUMF authorize the President to take sides in the Syrian Civil War, or to attack Syrian rebels associated with al Qaeda, or to remove Assad from power? Yes, as long as the President determines that any of these entities has a (mere) connection to the use of WMD in the Syrian civil war, and that the use of force against one of them would prevent or deter the use or proliferation of WMD within, or to and from, Syria, or protect the U.S. or its allies (e.g. Israel) against the (mere) threat posed by those weapons. It is very easy to imagine the President making such determinations with regard to Assad or one or more of the rebel groups. (2) Does the proposed AUMF authorize the President to use force against Iran or Hezbollah, in Iran or Lebanon? Again, yes, as long as the President determines that Iran or Hezbollah has a (mere) a connection to the use of WMD in the Syrian civil war, and the use of force against Iran or Hezbollah would prevent or deter the use or proliferation of WMD within, or to and from, Syria, or protect the U.S. or its allies (e.g. Israel) against the (mere) threat posed by those weapons. Would you like to send your own son or your own daughter to fight in Syria just so that a natural gas pipeline can be built? Unfortunately, his grandmother and most of our other insane “leaders” in Washington D.C. seem absolutely determined to take us to war. In the end, how much American blood will be spilled over a stupid natural gas pipeline? Originally posted on The Economic Collapse.